The Anti-Rafa: We're accustomed to Andy Roddick struggling on the red clay of Roland Garros, it's almost annual rite of spring. He came into the claycourt major with a 9-9 career record that one could describe as shocking given the fact that seven times he has played the event as a top eight seed. Roddick in Paris is as the anti-Rafael Nadal. Where Nadal's game on the clay becomes transcendant, Roddick's becomes maddeningly earthbound. Where Nadal's servicable serve helps him set up the points to his advantage, Roddick's muscular delivery is neutered by the slow clay. Nadal's movement and court positioning feels embedded in his DNA on this surface, while Roddick looks and presumably feels as if the Parisian clay is Martian versus anything he's encountered here on Earth. Most tellingly, Nadal at Roland Garros looks all but invincible. Sliding and stomping across every centimeter of the vast backcourt at Philippe Chatrier, there's a glint in Nadal's eye when he plays this tournament that all but verbally growls "This is my house." Roddick, on the other hand, just looked like he wanted to go home. It didn't take long before the American got his opportunity. Roddick's entire 2012 season to date has been one to forget. Hamstrung by injury all season (pun intended), he brought a 7-9 record on the year to the Bois de Boulogne, including three straight losses in the World Team Cup last week. 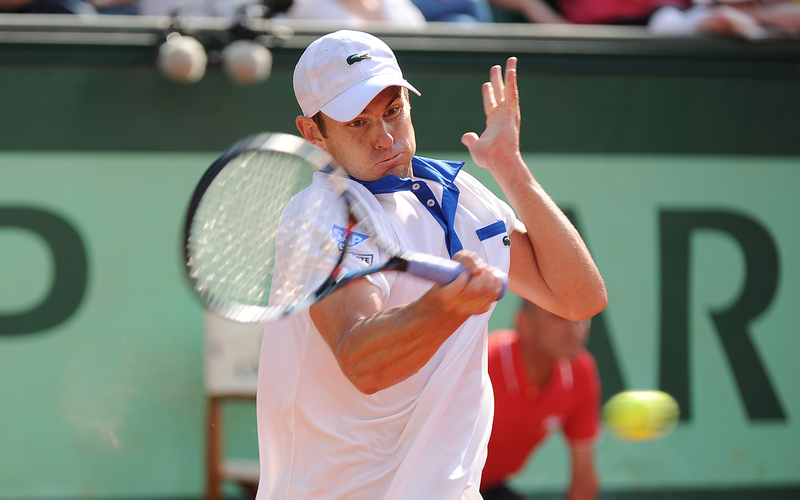 The American's negative momentum continued today with a listless 6-3, 6-3, 4-6, 6-2 loss to Frenchman Nicolas Mahut. For context, while Mahut is French and presumably had more positive vibes about playing at Roland Garros than Roddick, the victory today ensured Mahut's second trip to the second round in an event he's played ten times. In other words, Mahut doesn't typically thrive here either. Roddick lost more than he gained playing on the clay this year. Starting with the purely numerical, Roddick is now ranked 33rd in the world, even with no points to defend from Roland Garros last year, his ranking may fall even further before he reaches his beloved grasscourts. The bigger question is can Roddick again summon the belief that's so necessary to play at or near the level he maintained throughout most of his underappreciated career? Yes, this is clay; yes, it's Roland Garros, but this was a match Roddick should have won. This was the kind of match Nadal, and yes, even vintage Roddick would have seized with both hands. 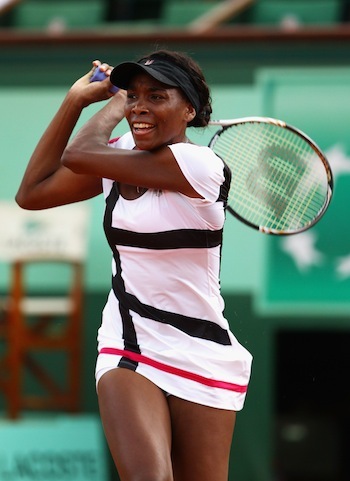 She's Our Venus: With the diagnosis of Sjogren's Syndrome coming during the 2011 US Open it seemed for a time that Venus Williams was going to be relegated to the Eleven design studio for the foreseeable future, especially after a string of withdrawals at the beginning of the 2012 season. Well, Venus is back and while we wouldn't count her among the favorites to win this title, it's nice to see her back on the court. Compared with her baby sister Serena, as she always is, Venus' run on the clay has been rather different. Serena is 17-0, Venus 7-3, but at this stage in her career, the almost 32 year old Venus could consider those three matches good losses, as she's fallen to Samantha Stosur, Maria Sharapova and fast-rising Angelique Kerber. She won't though, she's still here to win. Presumably inspired by a chance to play the London Olympics on the Centre Court where she's won five of her seven singles majors, Williams has pushed her ranking up over 80 positions and stands on the cusp of Olympic eligibility at World No. 53 entering Paris (the top 56 are automatically eligible, as long as they are among their nation's top four). Today she took another step forward toward that goal with a 4-6, 6-1, 6-3 win over young Argentine Paula Ormaechea. When I say young, I mean that when Williams played her first WTA match, Ormaechea was 3 years old. Ormaechea acquitted herself nicely, pushing Williams around early, and drawing 17 unforced errors off the American's racquet in the first set before Williams zoned in. When she began dialing up the winners and backing up her first serve, the French crowd dialed up their support as well, cheering Venus warmly as she closed out the match. Playing the role of the grande dame (or less poetically, sentimental favorite) at this stage in her career, Williams is likely to face another youngster, 3rd seeded, 23 year old Agnieszka Radwanska in her second round match. Given what we saw today, she'll have the Parisian crowd firmly behind her and more than a puncher's chance of pulling the upset. Change Is Good (We Hope): Nothing to do with the tournament itself in any significant way, yet, at least, but today news broke that former World No. 1 Caroline Wozniacki has hired a new coach in 2002 Australian Open champion Thomas Johansson. One has to wonder, is reality finally sinking in the Wozniacki camp? Let's be clear, we're not the camp of Wozni-activists who think the almost Great Dane's career needs saving. In fact, we would say that actually Wozniacki has a fine resumé, her 67 week run atop the WTA rankings is impressive, it's more than Ana Ivanovic, Maria Sharapova, Kim Clijsters and Venus Williams combined. She's also amassed 18 titles including WTA Premier events in Indian Wells, Dubai and Canada among others, ranking her fifth among active players behind the Williams sisters, Kim Clijsters and Maria Sharapova. That's six times more tour level titles than Samantha Stosur, but as we all know Stosur leads in the historical ledger 1-0, with her US Open title last year. Wozniacki may have been in neutral during her time at the top of the rankings, but one can't deny that she's been in reverse all of 2012. Her vaunted consistency in non-major events has been lacking. She's 20-10 on the year and has unceremoniously fallen from No. 1 as we entered the season in Australia to No. 9 as the tour swings its way into Paris. Even the Copenhagen event that Bethanie Mattek Sands dubbed the "Caroline Wozniacki Tournament" crowned a different champion this year, as Wozniacki fell to surging Angelique Kerber in the final. Johansson joins Wozniacki's camp with a few goals, arresting her slide foremost among them. For a player who's just 21, Wozniacki's already had a long career, but she's done so to this point without a sustainable blueprint for improving. Without the pressure of living up to being a World No. 1, here's hoping Wozniacki will finally make the changes to her game that will give her a chance of winning the major she's long sought. A whole new You are able to side branch ended up being popped throughout 1909 to deliver to the style in the brand-new breed of cartier replica millionaires. Prior to the nineteen sixties, your Paris, france, Manchester, along with The big apple twigs ended up portion of one particular agency nevertheless controlled on their own, participating every time needed. Throughout 1962, the modern You are able to side branch ended up being distributed, as well as your Paris, france side branch throughout 1965. Your agency ended up being reunited along with reorganized throughout 1979 while hublot replica. Cartier happens to be renowned due to the clocks along with "novelty items" including cig circumstances and also due to the proposal wedding rings. designer watches wedding rings are made from the very best qualities involving mining harvests along with precious gems, along with created by get better at artisans. As being a chanel replica these are high-end goods. By way of example, your us platinum designer watches engagement ring using one particular rounded excellent lower precious stone. That could be a pair of thirty day period of an very big earnings. In addition there are selections involving spectacular along with new wedding rings hublot replica sale plus the selection to experience a engagement ring made to order. It's not an economical selection. On the other hand, gucci replica wedding rings can be acquired by way of solutions including amazon for the small percentage in the charge, along with there are several various other internet sites wherever designer watches wedding rings is available pertaining to diminished price ranges.